Educational Qualification : Certificate as registered Nurse and Mid wife having passed three years course in General nursing and Mid wifery from a school of Nursing or other Institution recognised by the Indian Nursing Council or B.Sc (Nursing) Note :The Indian Nursing Council has also laid down certain special concessions for the above courses in respect of Auxiliary Nurse - mid wives. Midwives and ‘B’ Grade nurses by way of reduced course period etc., Candidates obtaining the qualification prescribed above under these concessions will also be eligible for engagement. Examination Fee: Candidates applying for the Para Medical Posts on full time contract basis in response to this notification have to pay the prescribed fee online as detailed below: For UR / OBC candidates, application fee is Rs.500/-. Of this fee, an amount of Rs.400 shall be refunded to candidates appearing the screening test. No refund will be given, if candidates do not appear in screening test. For SC / ST / PWD / Women/ Economically Backward/Minority Candidates, application fee is Rs.250/-. Full refund of Rs.250/- shall be made to all such candidates on appearing the screening test. No refund will be given, if candidates do not appear in screening test. I. General Conditions : 1. The engagement of the Para Medical Staff would be on the full time contract basis for a period of one year or up to 30.06.2019 (if the scheme of engagement of Paramedical Staff on contract basis is not extended) or till regularly selected RRB candidates are available whichever is earlier. 2. The services rendered as Para Medical Staff on contract basis is a stop gap arrangement and will not have any bearing in respect of consideration of their period of service in case of regular selection through RRB. 3. Full time Contract Staff who enters into contract with the Railways will not have any claim or right for his/her regularisation or absorption in Railway service. 4. During the validity of contracts, the Railway Administration will be at liberty to terminate the contract by giving 15 days’ notice at any time during the contract without assigning any reason whatsoever. The contract shall also be terminated forthwith if the work of the Contract Staff is found to be unsatisfactory and the full time Contract Staff is found to be mentally or physically incapacitated. 5. Candidates proposed to be engaged on contract will be subject to Screening Test and medical examination and should be found fit in the medical classification mentioned vide Para II. 6. 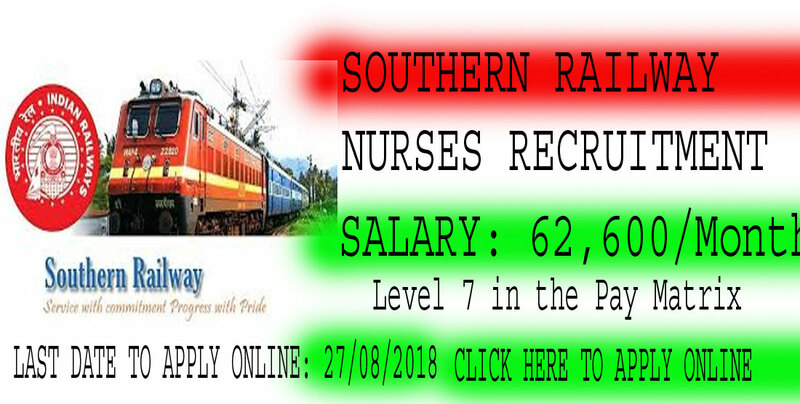 Candidates may please note that they are liable to be posted in any of the Hospital in Southern Railway. 7. The detailed instructions with regard to the duties shall be given to the applicants who are selected, along with the offer of engagement. 8. The SC/ST/OBC candidates should submit a self-attested copy of the caste certificate issued by the competent authority in the prescribed proforma. OBC candidates must ensure ‘non creamy layer’ certification and such certification should not be more than one year old at the time of Document Verification. Applications complete in all respects should be submitted “ONLINE” ONLY before 17.00 hrs of 27.08.2018. Applications sent by post will not be entertained. Applicants are requested to go through the details given below carefully before applying. Application can be made for only one category. In case of Applicant submitting more than one application, his candidature will be cancelled.